Unlike stand-alone, spreadsheet-based risk management solutions, ARM provides a simple, secure, centralized, web-based system that meets the risk management needs of individual departments, and the organization as a whole. Because ARM was built to be simple and easy to use, it accelerates the adoption of consistent risk management processes across operations and projects. ARM drives value by providing a complete and integrated ERM system that ensures greater visibility of critical risks, reduces surprises and provides a complete audit trail across the enterprise. ARM’s centralized Risk Register simplifies top-down, bottom-up and cross-organizational risks, issues, incidents and opportunities. 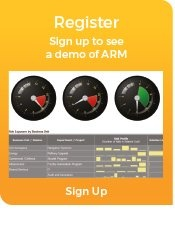 ARM is the world’s first web-based ERM solution and a proven technology platform with over 10+ years of focused software development and innovations. ARM is one of the most audited risk management solutions in the world. ARM contains a core platform of technology built on the latest Microsoft™ .NET Framework that couples to your choice of Oracle or Microsoft SQL databases to meet your organization’s unique IT requirements. This trusted technology scales effectively from one capital project to a portfolio of programs to functioning throughout the entire organization. Our technology was purpose built for one thing – identifying and analyzing every risk encountered in an organization.